Branson, Missouri is more than just the mecca of musical shows. 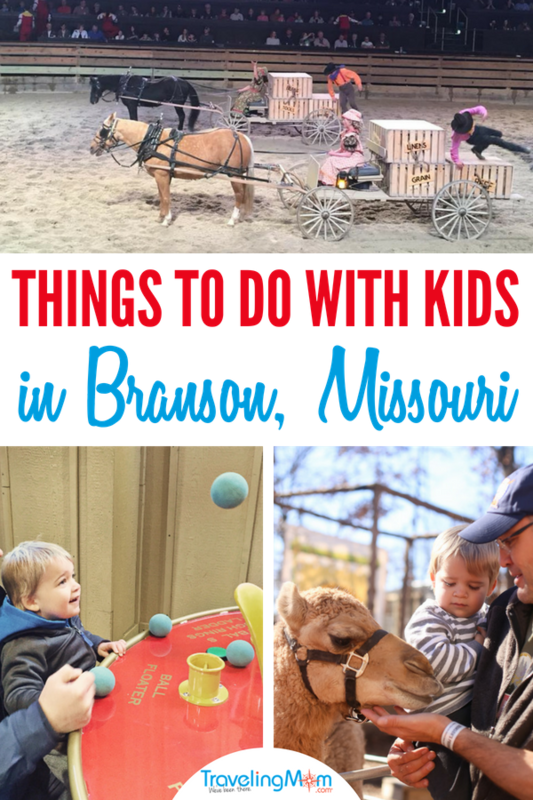 There are plenty of fun things to do in Branson with kids other than shows. It’s a great place to visit with your family and full of activities to keep both you and your kids entertained. From an interactive animal park to a stampede show full of kid-friendly food and animals, there are enough things to do in Branson to make your family want to visit Branson over and over again. A couple of years ago for Thanksgiving, my family decided to skip our traditional stay at home holiday and drove the three and a half hours south from Kansas City to Branson, Missouri. In previous visits to Branson, we’ve enjoyed fantastic musical shows that weren’t going to work with a younger kid in tow. This time around we opted to try more kid-friendly activities. These are some of the most fun things to do in Branson MO that we found during our trip. If you need more ideas of things to do in Branson, add on a day to checkout the Ozarks or nearby Table Rock Lake. Branson’s Promised Land Zoo is the only family-owned zoo, according to their website, that is dedicated to giving each visitor a personalized and interactive experience. Open every day from 8:30 a.m. to 6:00 p.m., the zoo gives your kids a one-of-a-kind, hands-on adventure! If you’re visiting from November 1st to December 31st, the zoo is also open from 5:30 p.m. to 11:00 p.m. for a Let There Be Lights Holiday Drive-Thru experience. The type of ticket you choose will depend on the amount of time you’ll need to visit and on how crowded the zoo is. They offer different types of tickets depending on what type of VIP experiences you want to add to the basic admission. You can get a breakdown of what’s included in the basic experience, better experience, and best experience here. The basic rule of thumb is that the more money you pay for a ticket, the more hands-on experiences you’ll get to have with the animals. If you have the budget for it, the animal encounters are definitely worth the price. We did something similar at a zoo in Gulf Shores, and it was easily one of the best things to do in Gulf Shores. Totally worth it for animal lovers! And if you really have the budget for it, the Promised Land Zoo also offers ultimate excursion packages that include everything listed above as well as an RTV guided tour through the new expanded zoo area. Children must be at least 8 years ago and accompanied by an adult. One of my toddler’s favorite experiences at the zoo was the parakeet paradise, where you purchase sticks with food on them and go into this enclosed room full of parakeets flying all around. If it’s a busy day, try to visit the parakeet room early so the parakeets will still be hungry when you get there. 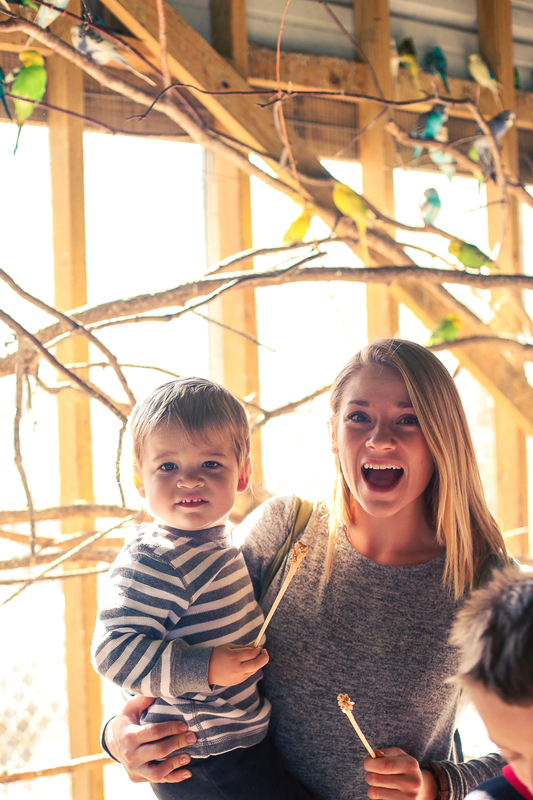 My son absolutely loved the parakeet room, but he was a little nervous at first about holding the stick himself. He only warmed up once my sister held him. If you have a toddler who is nervous around animals, it might be best to skip the parakeets or take it slow. You can also feed animals as you walk the on-foot safari if the parakeets are a bit much for your kids. In addition to the parakeet feeding, if you purchase a best or better experience, you will have the chance to feed other animals not on display in the zoo. You also don’t want to miss the daily live animal shows. 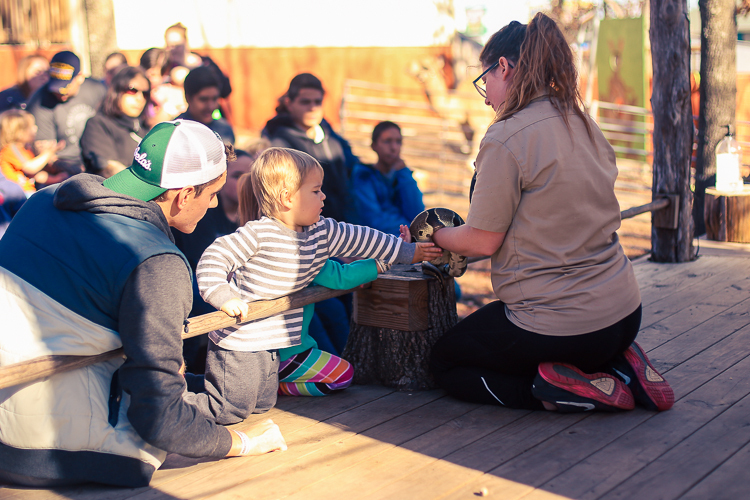 Zoo employees teach the kids about the animals and then the kids are given the chance to touch each of the animals they just learned about. My son and his cousins touched everything from a huge snake to a porcupine and even learned the proper way to pet the porcupine without being pricked. 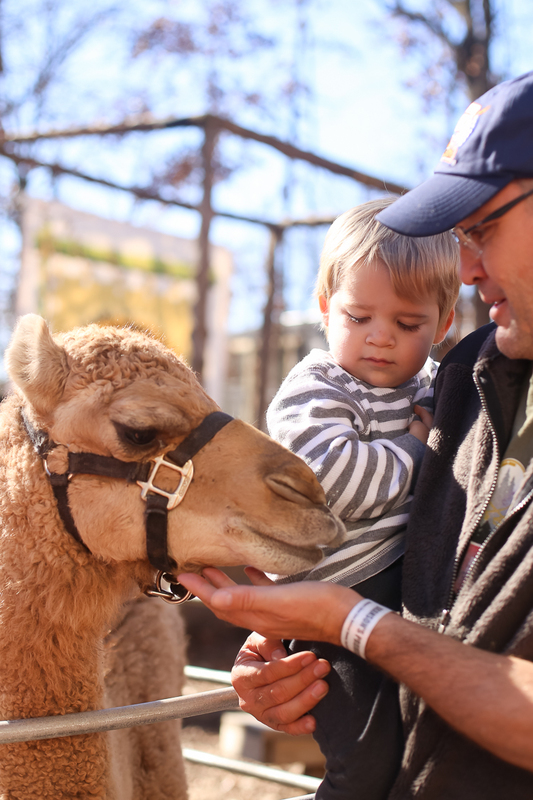 Live animal shows are currently scheduled daily at 11 a.m., 1 p.m., and 3 p.m. Check the website for the schedule before you go so you don’t miss this fun part of the experience. Silver Dollar City is a theme park filled with 40 rides and an abundance of shows. It’s open on select dates from the middle of March through December. Along with thrill rides like roller coasters the park also includes a variety of attractions just for kids. It’s easily one of the most fun things to do in Branson and one of the best amusement parks in Missouri! Silver Dollar City is also home to an incredibly rich history surrounding one of its most unique attractions — Marvel Cave. Marvel Cave is a national natural landmark that, according to our tour guide, has one of the largest cave entry rooms of any cave in North America. The Herschend family built Silver Dollar City back in 1960 right on the surface of the cave as a way to generate more traffic to visit Marvel Cave. Now more than fifty years later, guests can both tour the cave and enjoy the many attractions and wonderful entertainment Silver Dollar City offers. If you do the Marvel Cave Tour, know that you will most likely need to carry young kids for the majority of it. The path and the stairs are steep and windy, and a toddler falling on either can be dangerous. The part you don’t have to carry them for however, they will love. The cave itself is humungous and the views are expansive. Our full group, including my grandparents and toddler, did the tour, but I had a lot of help carrying him through the tour. Silver Dollar City’s rich heritage is also seen throughout the park in the form of craftsmen demonstrations of everything from bread making in Sullivan’s Mill to candy making in Brown’s Candy Factory throughout the park. In addition to watching the demonstrations, you can shop the same handmade crafts and food you watched them create. And don’t miss out on the country’s largest selection of cookie cutters, which includes the traditional shapes to less traditional dinosaurs and punctuation marks. I picked up six small cookie cutters to make my toddler T-rex cheese slices, turtle toast, and elephant eggs. Silver Dollar City has two fantastic kid areas, Fireman’s Landing and The Grand Exposition, where kids can either ride rides alone or with an accompanying adult. It’s the perfect way to introduce them to thrill rides and mini roller coasters without tossing them into the deep end. Between the two kid areas, there are almost 20 rides. My son’s favorites were the Fireman dog ride in Fireman’s Landing and The Happy Frog in The Grand Exposition. Another family favorite is the firehouse play place in Fireman’s Landing. The play area is broken into two air-conditioned sections. The first is designed for young kids and full of foam things to play on. While in the second much larger space, everyone can gather, shoot, and throw soft balls at each other. Our entire group spent about an hour just in the firehouse playing together. Watching my almost 3-year-old pelt his great-grandpa with foam balls while great-grandpa chased down my two brothers was one of those priceless memories I’ll never forget. Silver Dollar City also has a water park called White Water that’s open only during the summer. Since we were there during Thanksgiving, we didn’t get a chance to go, but my family has been before. They said it’s worth a visit if you have time and the weather is right. The water park has 13 acres of water activities and slides for all ages. 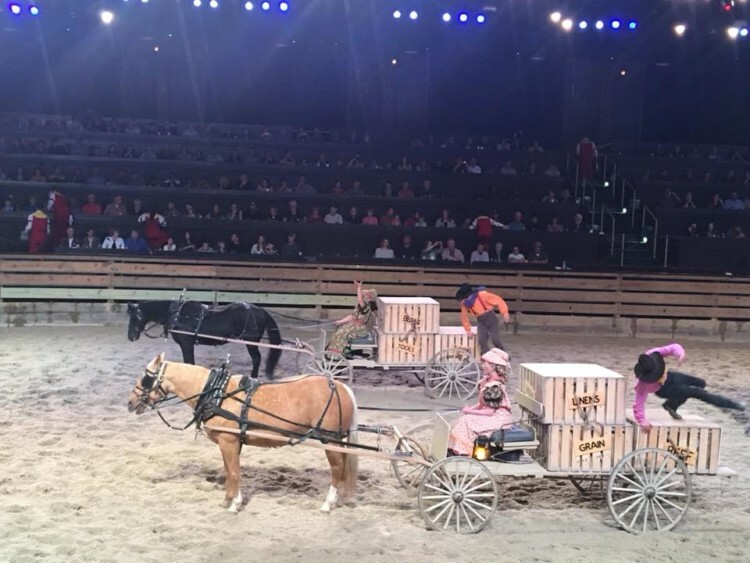 A ticket to Dixie Stampede comes with the chance to pet horses, a delicious four-course feast, and a show full of comedy, music, and live animals stampeding through the arena. My toddler couldn’t take his eyes off the arena as the horses jumped through fiery hoops. Kids of all ages will absolutely love the show even if it is a bit corny. I know all four of the kids in our group, ages ten down to two, did. Who knows? You may even be lucky enough to have Dolly Parton attend one of your shows! The Dixie Stampede is just one of the many fun musical shows in Branson. If you have children under 3, they are free if they sit in your lap and eat from your plate. However, if you want them to have a seat or a meal of their own, purchase a children’s admission. TravelingMOM Tip: Bring plenty of baby wipes. The four-course feast includes biscuits, vegetable soup, half a potato, corn on the cob, a small rotisserie chicken, a smoked pork loin, an apple turnover, and unlimited soft drinks or lemonade. And the fun part? You eat with your hands. You’re going to want those baby wipes not only just for your toddler, but you’ll also likely want to wipe your hands as well when napkins just don’t cut it. What else is there to do in Branson with kids?